SHANGHAI — To some, plastic surgeons are just scalpel-wielding doctors. But to Chen Siqi, her plastic surgeons are “second parents” who gave her a brand-new life. In December 2017, the then-19-year-old university undergraduate took 10,000 yuan ($1,500) in savings, applied for a 10,000 yuan loan, and flew to Shanghai. As she lay on the operating table of a private cosmetic-surgery clinic, Chen remembers not feeling nervous or afraid. “In any event, I can’t be uglier than I already am,” she remembers thinking. In a couple of hours, a surgeon created creases in her eyelids, enlarged her eyes by cutting open the corners, and removed excess fat. Afterward, Chen’s life changed. She now notices second glances when walking down the street. She has received offers from internet companies who want her to become a livestreaming host — she accepted — and from a former boyfriend asking her to come back — she declined. Satisfied with the results, she bought more procedures to heighten the arch of her nose, whiten her skin, and puff her cheeks. After spending 200,000 yuan in total, Chen felt like she had switched her old head for a new one. 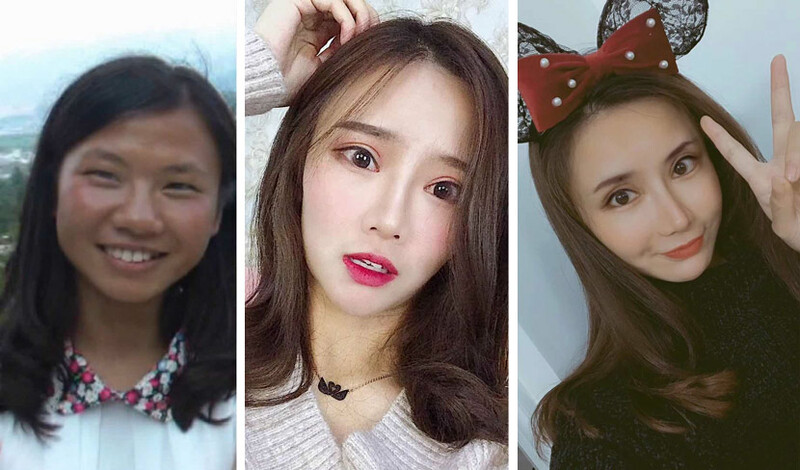 Fueled by the desire to take good selfies and emulate celebrities, many young Chinese like Chen are opting for surgery at increasingly younger ages. Independent statistics on plastic surgery in China are hard to come by, save for a prediction from an industry body that the market would be worth 800 billion yuan this year, compared with half that in 2015. There are several cosmetic-surgery social apps that connect those who are curious about surgery with ever-expanding listings of medical institutes and surgeons. On Gengmei, one such app which saw its community skyrocket to 36 million users and 20,000 certified surgeons in recent years, the average age of first-time consumers dropped from 28 in 2016 to 22 in 2017. Gengmei estimates that 22 million Chinese people underwent cosmetic surgery in 2018, and that 54 percent were under 28. Patients born after 2000 made up 8 percent, even though patients under 18 require their parents’ company and consent to undergo surgery. A competing app, SoYoung, says it has noticed similar trends. 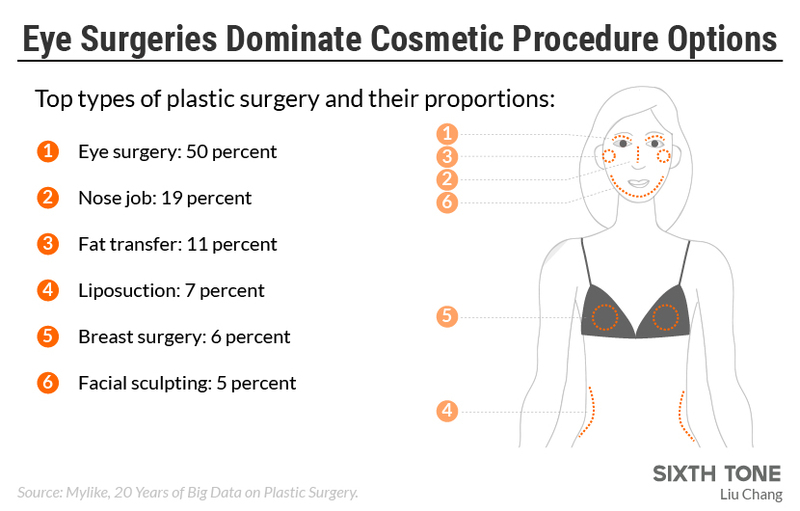 The figures directly contrast with those from the United States, the world’s largest cosmetic-surgery market, where nearly 75 percent of cosmetic-surgery patients are over 35 years old. 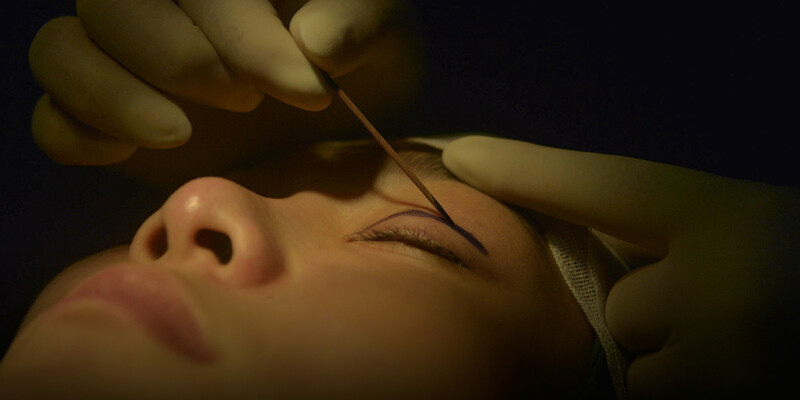 Many Chinese cosmetic-surgery clients are influenced by K-pop and Korean beauty standards. China’s booming industry is following in South Korea’s footsteps, where about one-third of women aged between 19 and 29 have had plastic surgery. Chinese parents and teachers tell children to focus on their studies instead of their appearances — in many schools, students must cut their hair to shoulder length or shorter, leave their jewelry at home, and wear baggy uniforms. 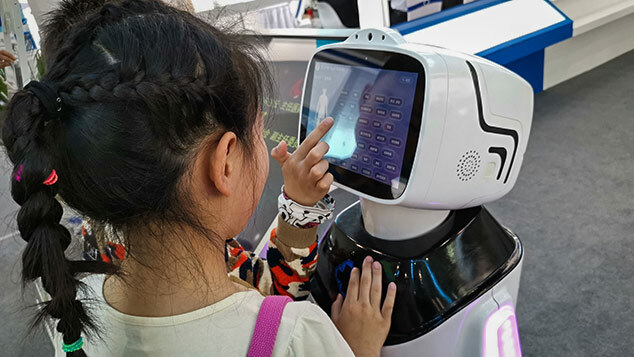 But China’s youngest, “post-’00,” generation — those born after 2000 — has already internalized that appearance is key to getting ahead in life, says Liu Di, CEO of Gengmei. “Post-’00s and students are living in a time when connecting with strangers is very important [due to social media and social mobility], and becoming more attractive can help them gain more social acceptance.” And to them, nice clothes and cosmetics don’t cut it. In the summer of 2017, several months after Fan Tiantian took her college entrance examinations, the 18-year-old and her mother walked into a top public hospital in Harbin, in the northeastern province of Heilongjiang, to get plastic surgery. Already, around 10 students at her high school had undergone eyelid surgery and nose reshaping. She couldn’t wait to join their ranks with an eyelid procedure. “The holiday after the national college entrance exams is the golden period for plastic surgery, so you can have a fresh start in university,” Fan says. To cater to young clients like Fan, cosmetic clinics give discounts to students during the holidays. Gengmei also has special student deals around graduation and job-hunting seasons. For people without steady incomes — like students — clinics offer so-called face loans to foot the bill. 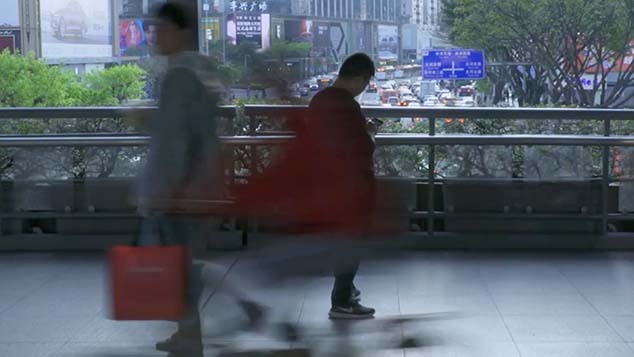 Gengmei cooperates with payment app Alipay’s microlending service Huabei. Though Fan was what many consider pretty for women, with a tall and slim figure, a high-bridged nose, and puffy under-eyes — called “lying silkworms” in Chinese — her classmates still made fun of her appearance. “Some boys in my class would always laugh at me: They’d call me ‘tiny eyes,’” she says. After the surgery, reactions were different. Her university teachers liked her, despite giving her failing grades in some classes. Whenever she was lifting heavy luggage, someone would help. “People always display better attitudes and more patience to prettier people,” Fan says. The holiday after the national college entrance exams is the golden period for plastic surgery, so you can have a fresh start in university. Because Fan’s parents had always told her she was cute, she thought they would oppose her decision. But when Fan brought up plastic surgery to her parents, it didn’t take her as much effort to persuade them as she had expected. Her mother fully supported her, as eyelid surgeries are a relatively simple and common procedure, and her father wasn’t “diametrically opposed,” provided she went to a good hospital. On the day of the surgery, Fan saw many more young patients, also accompanied by their parents. “Our parents are more open-minded now. They can understand the younger generation’s choices and they realize how appearance matters for a first impression,” Fan says. Sometimes, it’s even the parents themselves who suggest their children go under the knife. Before her daughter, Yihan, went to college, Lu Juan thought it was time for her girl to be “prettier.” She had always lamented that Yihan had gotten her father’s eyes, which are small and don’t have creases in the eyelids, and not her own, which have “Western-style double eyelids,” she says. In the summer of 2013, Lu visited her friend’s private clinic in eastern Zhejiang province’s Ningbo. There were several photos on file of patients her daughter’s age. “Those before-and-after pictures were so tempting,” Lu says. She considered eyelid surgeries “low-risk” and “highly prevalent,” and sent her daughter into surgery. Following the doctor’s suggestion, the pair also received temporary hyaluronic acid injections to puff out their temples and chins and improve their facial symmetry. “People would always call me a ‘good girl,’ but slowly, I noticed that they changed the word to ‘good-looking,’” Yihan, who is now 24 and doesn’t want her family name published, tells Sixth Tone. Although the surgery gave her more confidence, she would think twice about doing it now. These days, a wider range of looks are considered beautiful, she says, adding that looks are less important when job hunting than they are in college. Though the industry is seeing a growing number of male clients, it’s women who face the most pressure to be good-looking on the job and dating market and who turn to plastic surgery. The essentials for what is considered pretty have long been considered non-negotiable: big eyes, high-bridged nose, cherry lips, sharp chin, and pale skin. 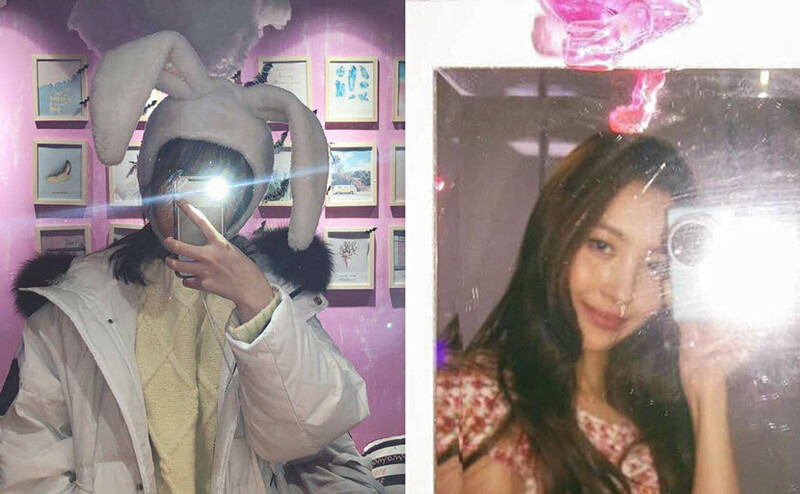 Virtually all women popular on social media — called wanghong — have these features, led by actresses Angelababy and Fan Bingbing, who are often considered “templates” for cosmetic surgeries. 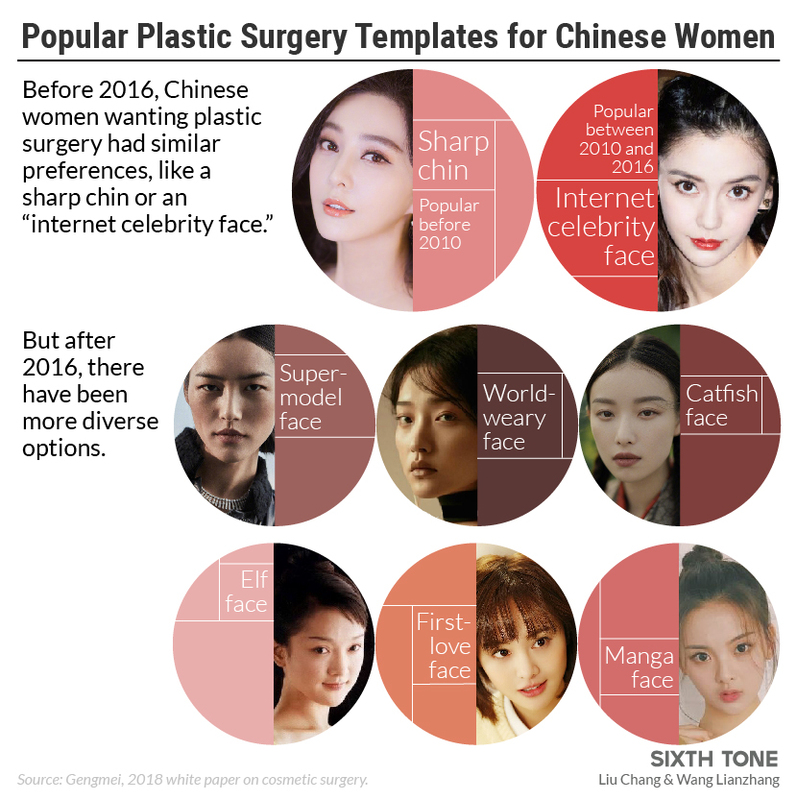 Plastic surgeon Shi Chengfang tells Sixth Tone that since about 2010, the “internet celebrity face” has been extremely popular among younger customers. (Patients who are over 35 years old prefer anti-aging surgeries for a more natural look.) But, he says, since 2016, fatigue with the abundance of such wanghong faces in the entertainment industry has given rise to a more diverse range of “templates,” such as the “supermodel face,” with longer eyes and a more chiseled jawline, or the “world-weary face,” with more droopy eyes and an aloof look. “This is an overthrow of the past aesthetic,” says Shi. “The public is tired of ‘Angelababy’ faces with overdone injections. They look like they were produced on the same assembly line.” He argues plastic surgery shouldn’t be used to radically change people’s appearances, but to treat deficiencies and bring out the best of people’s unique features. For example, eyelid surgery should be used to make people look more awake, not give them unnaturally large eyes, he says. One reason why so many clients are given surgeries they don’t suit, Shi says, is the paucity of qualified doctors and clinics, and the large number of them driven by profit. 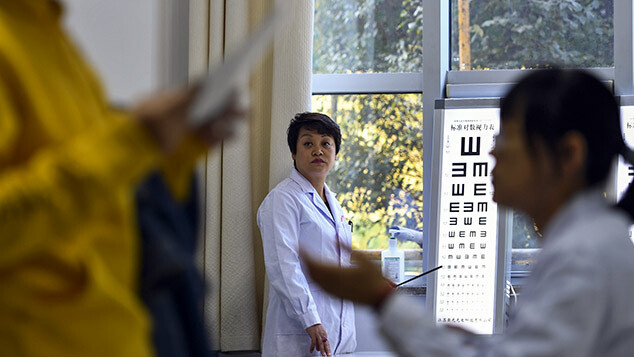 According to a 2017 report by Gengmei, there are 60,000 unlicensed clinics and 150,000 unlicensed doctors, six and 10 times as many as their legal equivalents, respectively. The standards at these clinics can sometimes be subpar. “The market is undergoing rapid but chaotic developments and still lacks supervision and punishments,” he says. Doctors in many illegal clinics don’t evaluate their patients’ requirements and agree to surgeries that Shi considers unjustifiable. But Chen Siqi, the livestreaming host, doesn’t care about these arguments. 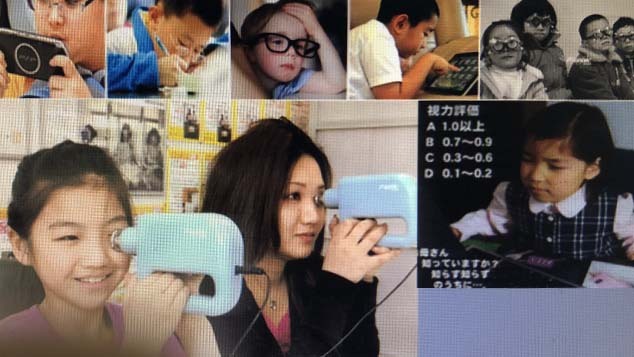 She’s not satisfied with her face anymore, and in December chose to redo an eye surgery and get a new high-bridged nose. She calls it a “mixed-race” face — half Asian, half European. This year, she plans to get her eyebrow bone lifted and get richer lips to finish the look — for now. She hopes people will notice all the work she has had done. It’s been expensive. Cosmetics surgery has helped me be the real ‘me,’ the ideal person I wanted to be. Though plastic surgery is becoming ubiquitous, it is not universally accepted. Consumers still face contempt from relatives, classmates, or colleagues who might accuse them of taking shortcuts in life or of being addicted to the wrong kind of beauty. Zhang, a student in her 20s who did not want her first name published, is in the middle of the job-hunting season for soon-to-be-graduates. During one job interview, the potential employer asked her directly: “Have you undergone plastic surgery?” She said yes, but felt uncomfortable with the employer’s manners. Zhang is a fan of K-pop and uses South Korean idol Sunmi as a template for her surgeries. “Of course, natural beauty is better than artificial beauty, but between naturally ugly and artificially pretty, I will definitely choose the latter,” says Zhang. Before, she felt her above-average, 172-centimeter height and her more mature appearance prevented her from expressing her coquettish side. But after getting bigger eyes and rounder cheeks, she felt more comfortable taking a cute selfie. “Cosmetic surgery has helped me be the real ‘me,’ the ideal person I wanted to be,” she says.